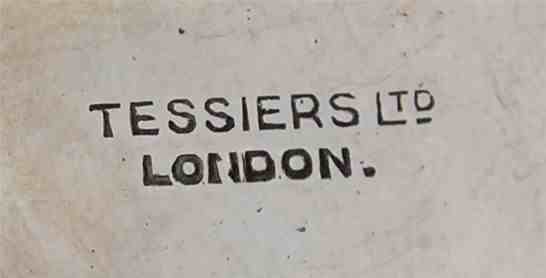 The firm claims to have been established in 1812, possibly by the descendants of Etienne de Tessier, a Huguenot refugee who arrived in England in 1712, but the first information about the business are in an 1841 directory listing a Griffin & Tessier, goldsmiths and silversmiths, at 32 South Audley Street. One of the partners was Louis (Lewis) Alexander Tessier (c.1795-after 1861) who in 1851 advertised as Louis Tessier & Sons, active as artists in hair mourning jewellery at 32 Conduit Street and 32 South Audley Street. After the retirement of L.A. Tessier (1857) the business was continued by his sons Henry Thomas Louis Tessier (1816-1891) and Edward Tessier. The partnership, active also at 26 New Bond Street, was dissolved in 1869. H.T.L. 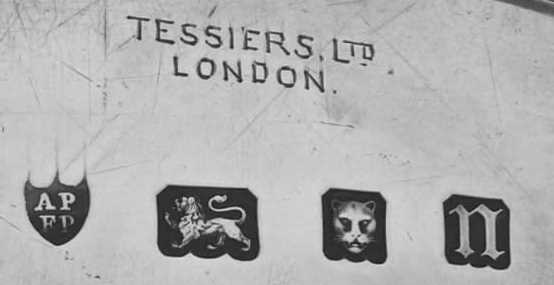 Tessier continued the business at 32 South Audley Street while Edward Tessier maintained the business at 26 New Bond Street. Edward Tessier died in 1875 and the business was sold to John Gotlieu Vander and John Hedges who continued the activity under the name of E. Tessier and/or Vander & Hedges. After the dissolution of the partnership with Hedges (1900) Vander continued the activity under the same style until his death (1910). The business Edward Tessier/Vander & Hedges was continued by Arthur Martin Parsons (c.1859-1943) and Frank Herbert Parsons (died 1934) and in 1920 the firm was converted into a limited liability company under the style Tessiers Ltd. The first directors were A.M. Parsons, F.H. Parsons and S.F. Parsons. Herbert Martin Parsons (1892-1981), son of A.M. Parsons, succeeded his father as head of the firm. The firm is now active in a newly established store at 10 Burlington Arcade Piccadilly as dealers in antique and modern jewellery and silver.